Okay, I heard ya. What good is an exhaustive list of Neko skins if you don’t know where to find Neko ears and tails? No problem, I can fix that! 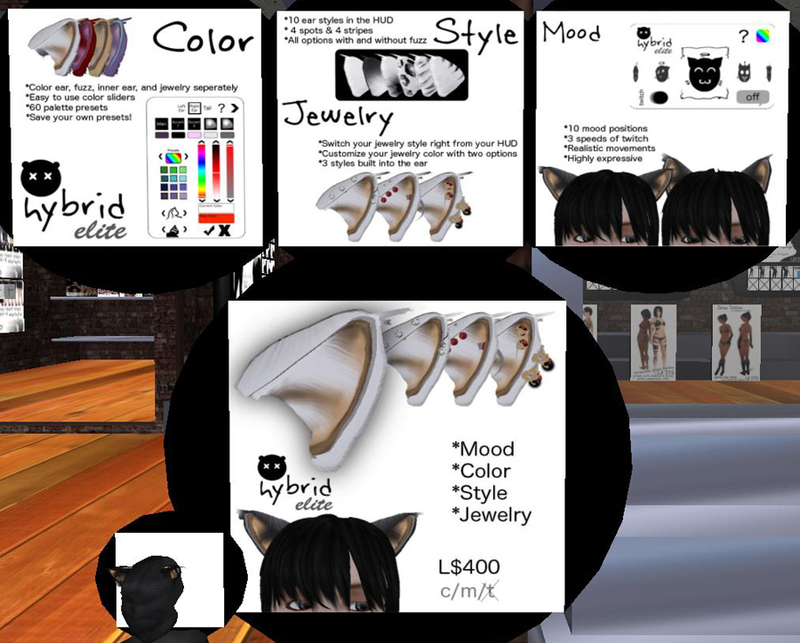 But holy cats… if I thought creating my list of Second Life skin stores was a challenge, I had no idea what I was in for with a list of Neko ears and tail stores. 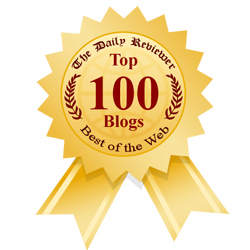 Never fear, no task is too great for you, my lovely blog kitties. Categorized and complete with SLURLS for easy shopping, here’s your very own list of Neko Ears and Tails. 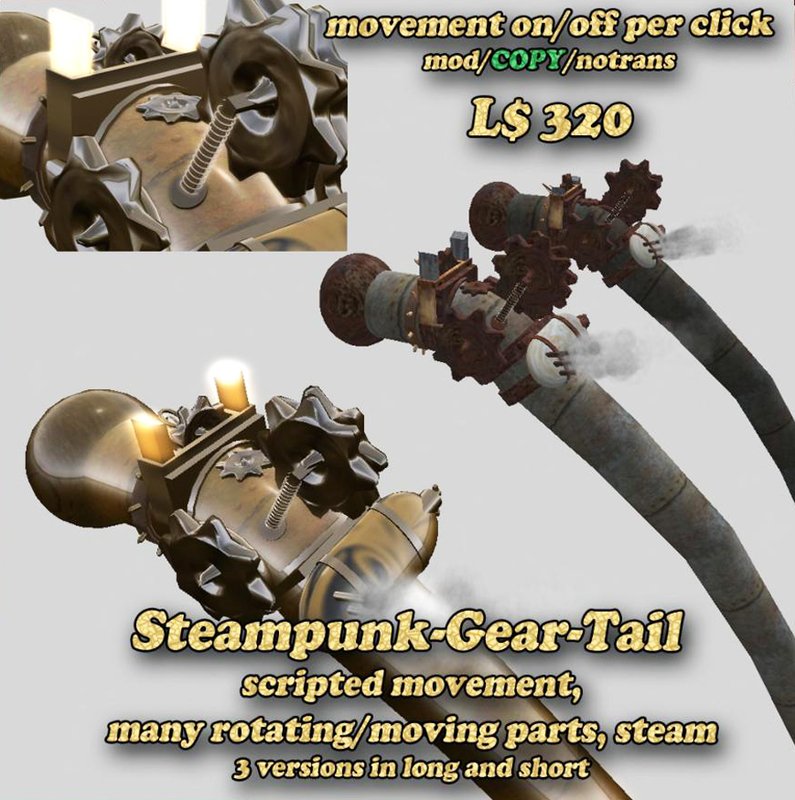 – Accessories: A list (and sometimes a description where the details warranted it) of all the cute bells, bows, wraps, spikes, cyberpunk, steampunk, and other unique adornments I found on Neko tails and ears. 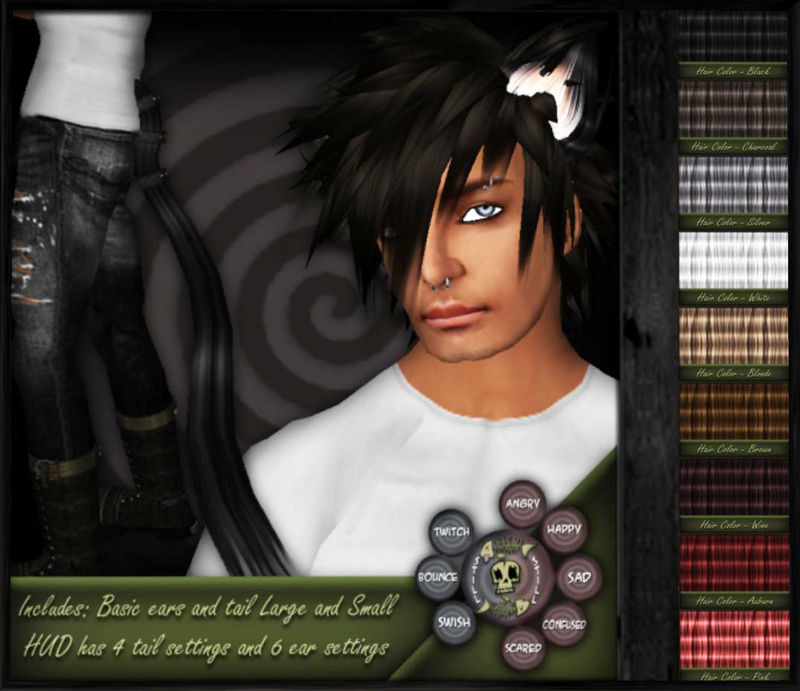 Photo at right: Urban Dare’s shorthair tail (live version on display in the store) showing the various textures that come inside the HUD, and one of the cute tail accessories (kitty cat). Hybrid’s “Elite” ear — Neko ears on steroids! Last but not least, for those of you still feeling tentative about coming out of the Neko closet, I found a couple free ears and tail sets to try on without remorse. For those of you on a budget, I located some scripted sets for cheap. Still others who are just entering kittenhood will be overjoyed to see the list of stores that offer ears and tails sized just for Neko kids. Probably yes. Just like my skins resource page, I’m sure I missed a store or three… but that’s where I rely on you readers to help me fill in the gaps. Send me an email (contact information can be found on my “About This Kitteh” page) along with an SLURL to the store, and I’ll check it out personally. Take me to the Virtual Neko Ears and Tails List! ~ by Stacia Villota / Virtual Neko on November 14, 2008.